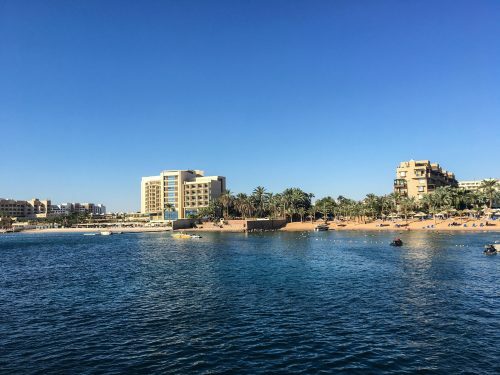 Aqaba, Jordan: Where to Stay, Eat, and Visit! 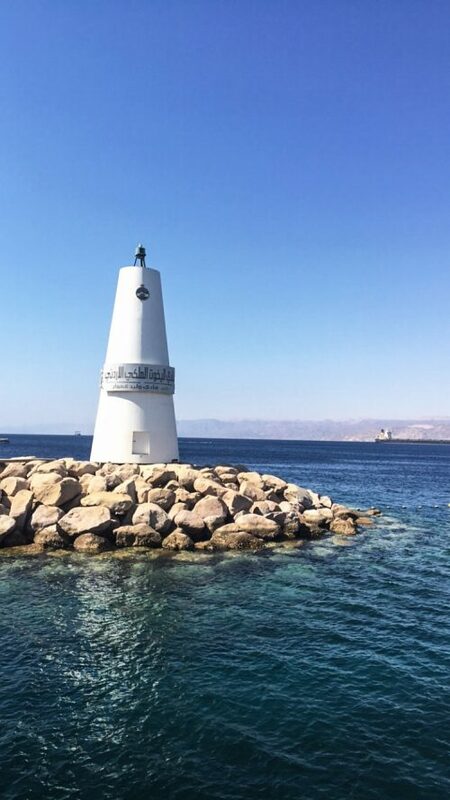 Aqaba is a vibrant port city located on the Red Sea’s Gulf of Aqaba. 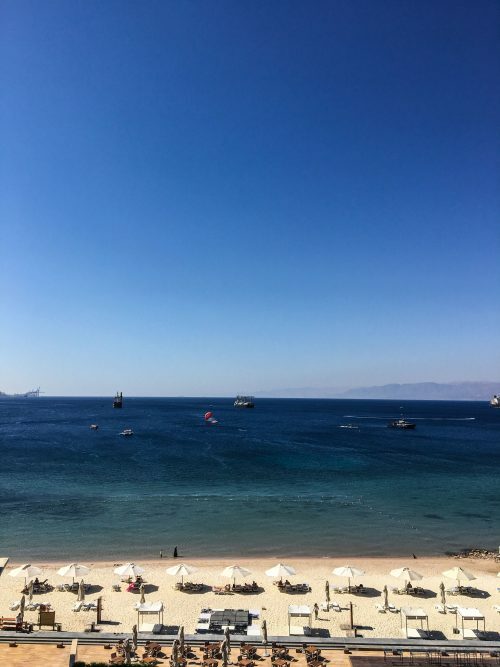 Famous for it’s beaches and scuba diving, check out my full guide on where to stay, what to eat, and what to do while in Aqaba! A coastal destination for Jordanians looking for rest and relaxation. Aqaba is located on the Red Sea’s Gulf. It’s the only coastal city in Jordan. This makes it a place prime for all things water related. One of the most popular activities is scuba diving. The Red Sea is home to some of the world’s best coral reefs and wreck dives. 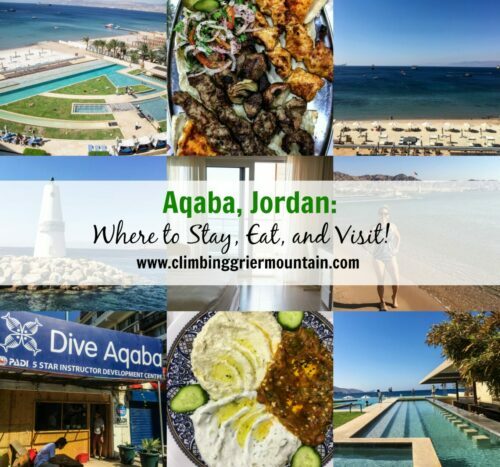 Besides scuba diving, Aqaba has many restaurants, disco clubs, private beaches, and so much more! 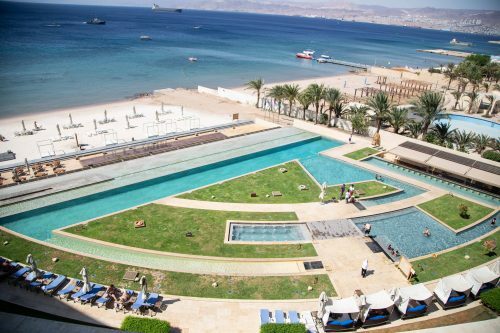 Let’s take a dip into our time in Aqaba – as it is sure to make a splash! Located about 60 miles directly south from Wadi Rum, Aqaba is the most southern point in Jordan, adjacent to the Red Sea. You can drive from Amman to Aqaba in about four hours! Again, you can drive yourself, but I highly recommend hiring a driver from Local Trips! After a night at desert camp, we were ready for some rest and relaxation. 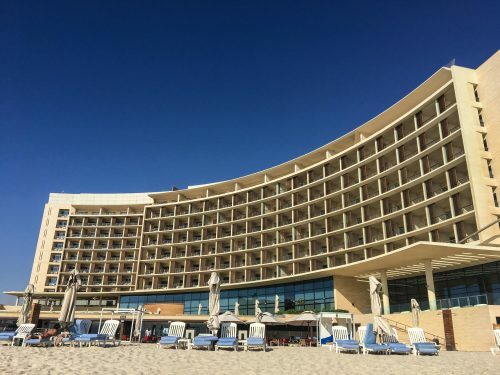 The Kempinski Hotel Aqaba Red Sea was the perfect sanctuary for our two-night stay in Aqaba. 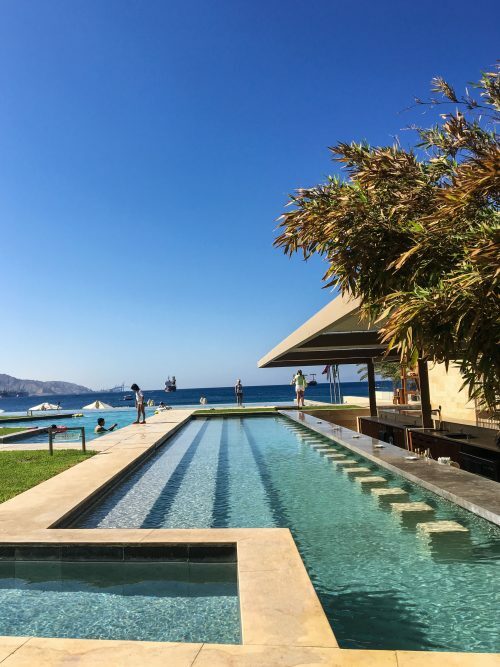 This five-star luxury hotel is located in one of the best locations just a stone throws away from many restaurants, dive shop, and marina! Our room was very elegant and complete with a comfy kind-bed, office work area, and relaxing soaking tub. 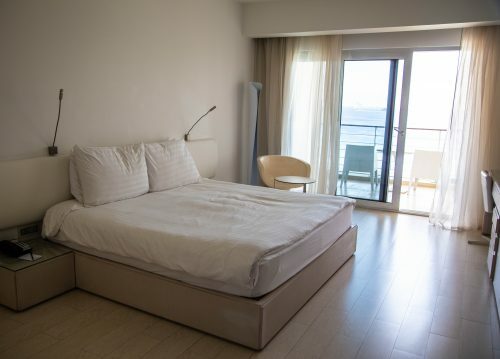 What makes their rooms so wonderful is the balcony views of the Red Sea. 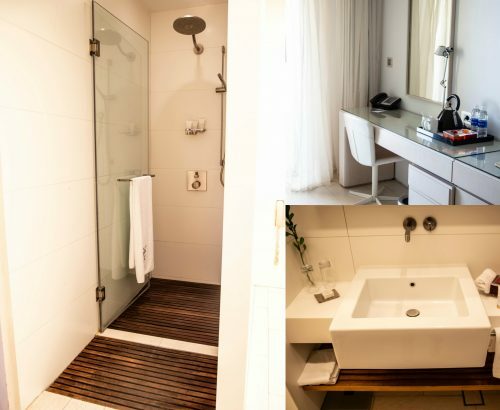 Besides a luxurious room, you can also relax at the spa. Also, there’s a private beach, including an outdoor pool complete with a swim-up bar and a near-by gym! Staying at the Kempinski Hotel has some major perks including excellent dining. From breakfast to happy hour to dinner, everything you will ever need or want it just a step away. The breakfast buffet is included in your stay. But this is not your ordinary buffet. The hotel offers an omelet making station, juice and coffee bar, pastries, and a mix of Jordanian and English staples. 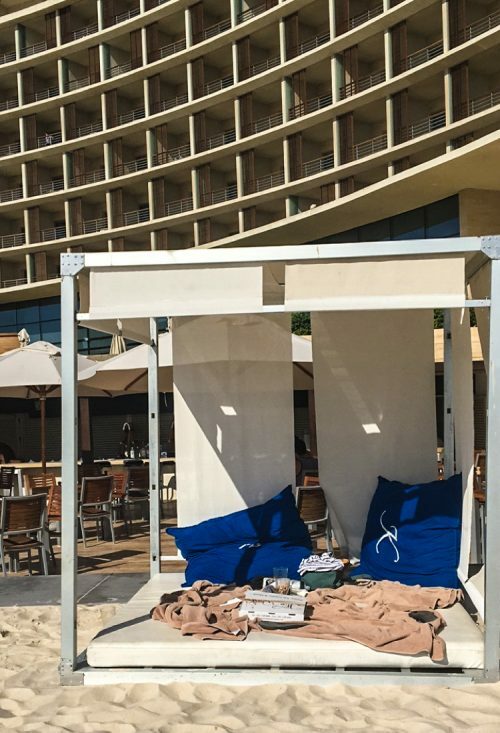 If you are going to do happy hour, then head to the Kempinski Hotel beach. 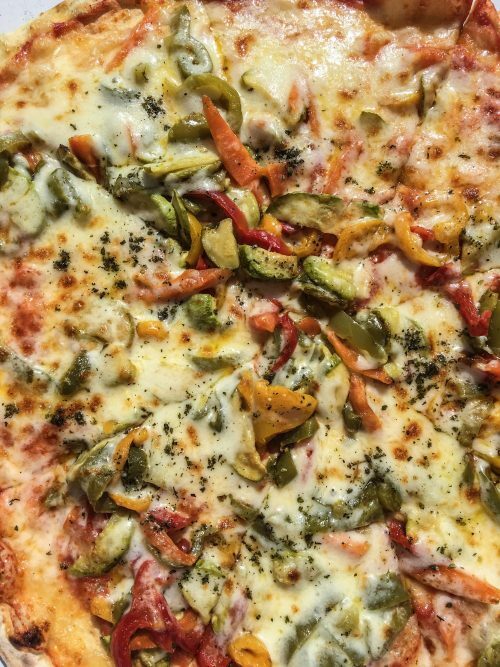 Grab one of the cabanas and order a few pints along with one of their delicious pizzas. Not a bad way to wind down the day. Dinner at the Kempinski Hotel is more like a giant party. Everyone sits outside by the ocean watching live entertainment like a belly dancer. The hotel buffet offers the biggest selection of Jordanian food I have ever seen! 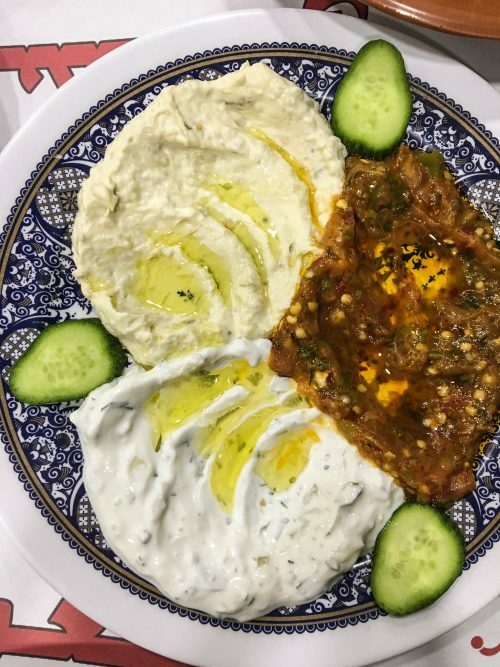 I’m talking shawarma, beef stew, chicken ouzi, and a meze of condiments like labneh and pickled veggies! Since our stay in Aqaba was brief we decided to venture out to a local spot for our last meal. 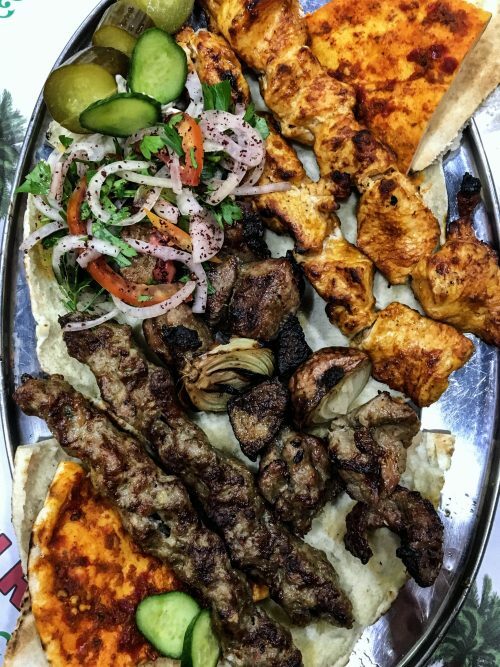 The dive shop recommended Al-Shami because they have delicious Jordanian barbecue. This restaurant is located just a few blocks from our hotel, which was a great way to stroll through the city and enjoy the fresh ocean air. Al-Shami is tucked away down in alley, so if you are looking for it keep your eyes peeled. Once you arrive they take you up a flight of stairs so you can dine outside. 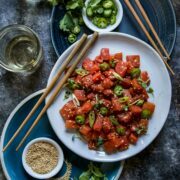 The menu is simple and full of so many tasty dishes. Make sure to start with a glass of lemon with spearmint juice. Just an FYI, there is no alcoholic beers served here. 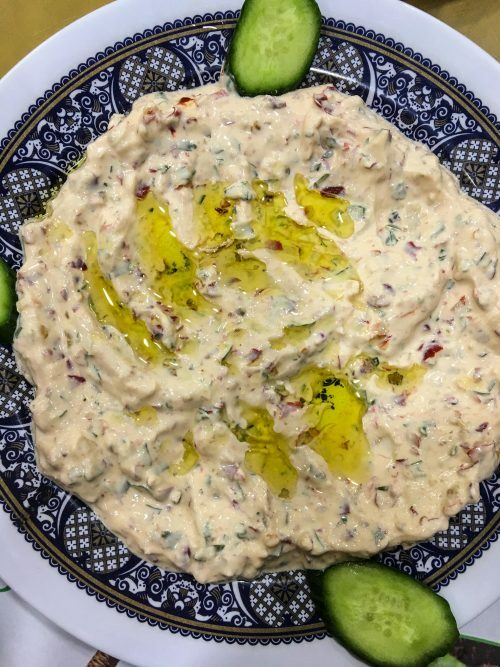 Once you’ve got your palate warmed up try a few samplings of their allepo olives, cucumber with yogurt, and eggplant. 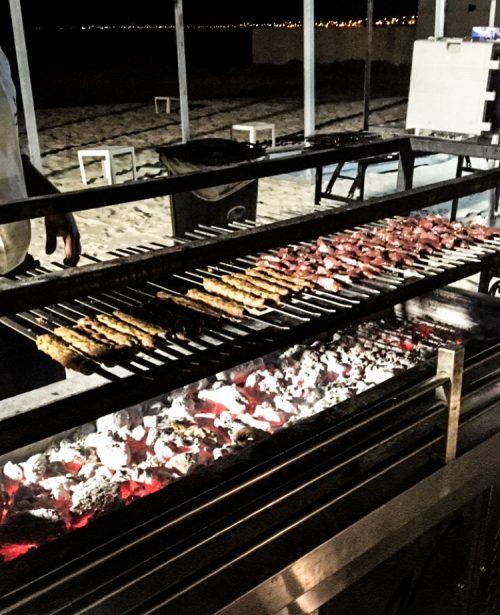 But don’t leave without getting a sample of the meze grill! Seriously, some of the best barbecue I’ve ever eaten! The main reason we included Aqaba in our Jordan adventure is because we wanted to scuba dive in the Red Sea. Did you know that you could scuba dive in Jordan? 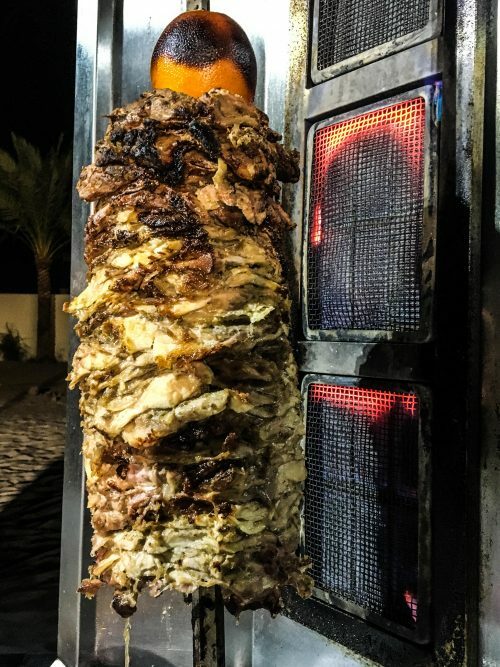 I didn’t until we did a little bit of research and found out that it is one of the favorite things do while in Aqaba. 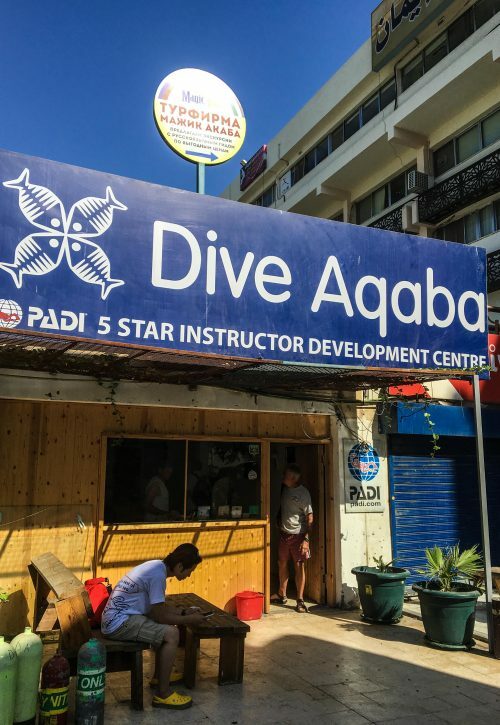 There are many dive shops in Aqaba, but I highly suggest using Dive Aqaba. Not only are they extremely thorough when it comes to equipment, they make a novice diver (like yours truly) feel comfortable and the giant boat keeps you from feeling like you will lose your cookies. The dive package includes a delicious lunch on board, plus, a bathroom to boot! We decided on a two-tank, one day dive for our excursion. 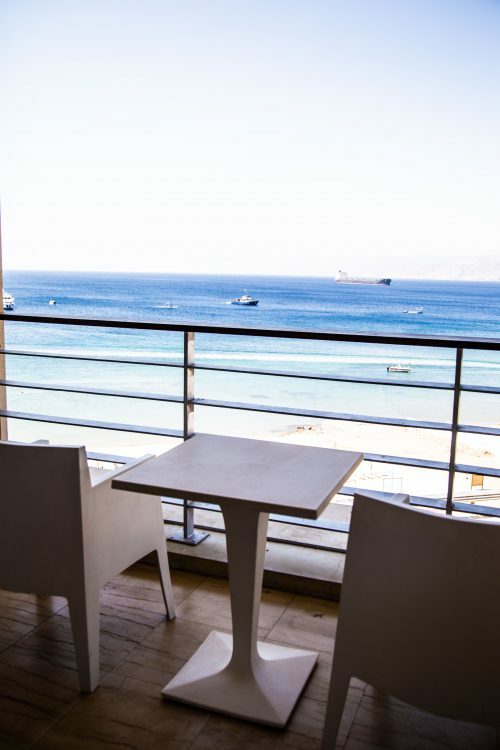 The boat is located in the Aqaba port, which is conveniently, located to our hotel. The boat ride is about an hour from port to the dive site. But along with way you can spot Saudi Arabia, Egypt, and Israel! Our first dive was to an actual wreck spot. It was amazing to see such a huge piece of machinery just lying on the ocean floor. 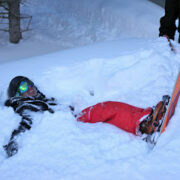 The best part was taking a spin through the large cabins. Our second dive was through what the locals call Japanese Gardens. Up until this point I thought the Caribbean was the place to see vibrant coral colors. Not true anymore! Everything in the Red Sea is extremely vibrant. I could have spent all day staring at the reefs! 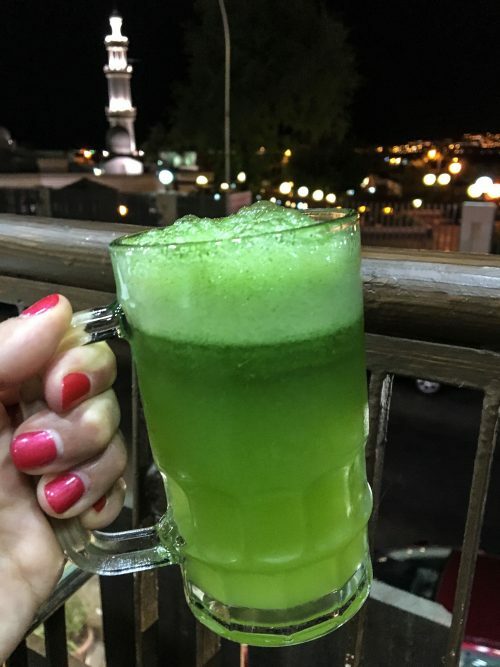 Mamluk Castle, Palm Beach, Aqaba Archaeological Museum, and a Glass Bottom Boat Tour. Stay tuned there is more to come on our adventures in Jordan. Next, we head north to the Dead Sea! More ocean breezes, floating, and sunset watching! It is very hard to make a professional messages in a short time period and nevertheless have heads full of concepts to make latest ones. I must declare that the blogger is a pro author. There is a short concern to inquire – how to produce such a ideal post? It has almost all parts what make a good article. Here is a catching title and interesting content. Well done! I should tell you that truly one of the most worthwhile content I have actually look over. It actually is also professionally printed. I am an English teacher so I see what I suggest. Good content! It could be a pure pleasures to browse it. Congratulation! Well-done! I am just looking for more messages. Dear writer! 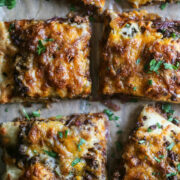 Thanks a lot for getting here and placing so well posts. 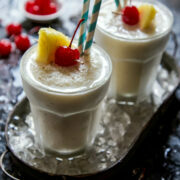 There is somebody who appreciate it and mention cheers! In my advice, not lots of bloggers own so numerous ideas to generate unique, intriguing content. Thanks for creating it and I want you didn’t lose the motivation to make the unique ones! I have constantly thought about how to put together top quality materials and publish them on the website. Nowadays I should state that the work is not for me. I allow it for pro authors.